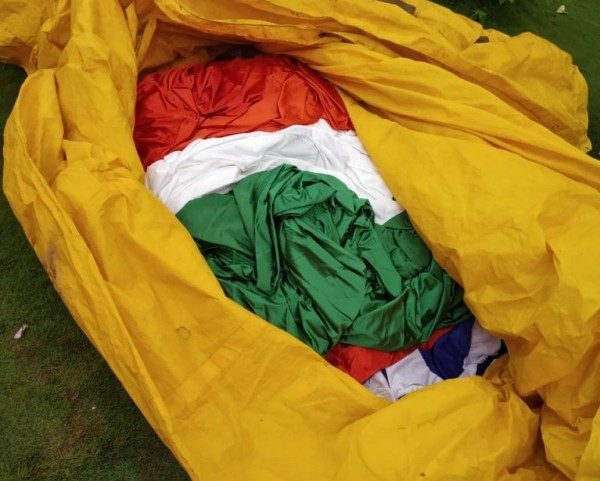 The largest national flag which was brought down after the rains commenced was found lying on the ground wrapped in tarpaulin. About 5 flags were changed and hence when the monsoon commenced it was decided that the flag is lowered to avoid damage. But since the last one month ,the National flag has been lying on the ground wrapped in tthe arpaulin on the ground. The flag after it was lowered could have been placed in some secure place but the agency has not looked after it. Belagavi City Corporation Commissioner Shashidhar Kurer said the Bajaj company who installed the Flag post had put the flag in a tarpaulin that too in a crumbled manner. Now the said flag has been shifted to the BUDA office and notice has been issued to the implementing agency.